If you haven't heard of the White Knight then you are probably new to four wheelin'. Team White Knight is a Calgary, Alberta based husband and wife team of Theresa Huarte and Robin Brisebois. They have made a name for themselves with their bigblock Chevy powered tube buggy and the website and DVDs it has spawned. 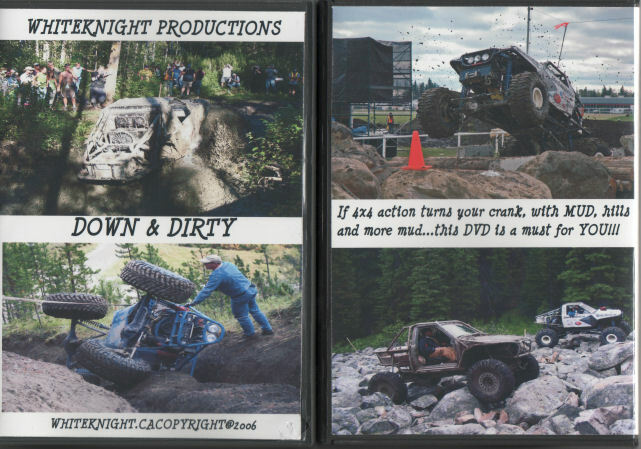 Down and Dirty is the latest DVD of their exploits. Rob did most of the driving in this movie while Theresa did most of the filming. As the name suggests this film is about mud, serious mud. Even if you are a rock crawler you can't help but be impressed with the sound of a high revving powerful big block churning big tires through the goo. It's plain to see that a lot of fun was had at each of the events shown and during the filming. Notable in the film are several former Top Truck Challenge participants including Don Henry, Tim Dzaman, Cory Hanson and of course team White Knight. The movie starts out with a club run at the Alberta Safari Park near Sherwood Park, Alberta. The next segment is the Canadian 4WD Magazine Offroad Challenge at Apex Mountain near Penticton, British Columbia. The coverage then returns to the Alberta Safari Park for their annual Tough Trail Challenge and after that there is a short "rock crawling" segment on the man made course at the 2005 Canadian Off Road Expo in Red Deer, Alberta. The last segment is of the 2006 whiteknight.ca message board get together in the foothills of the Rocky Mountains at Waiparous, Alberta. The DVD has some great tunes by local Alberta bands: The Villains, Stampede Queen and Dave Taylor. As the credits roll there are fun scenes of goofing around at Ken and Lisa Hodgins' place, Jeep Stuff 4x4; some motocross action at Blackfoot Park; a little bit of fabrication; some playing on the rocks and a couple of big smokey burnouts. This DVD is very entertaining. The quality of the DVD is very good and Theresa has done a great job producing it. The only things that didn't flow well were the fast forward repeat of the exact same action in the Off Road Expo segment, and the fact that the fonts and colors are different between each segment. However, neither of these minor details take away from the enjoyment of the DVD. I have watched it several times and it is great fun to see so many people that I know on my TV screen. I have also shown it to some non-wheeler friends and now they want to get 4x4s. Thank you to Theresa Huarte of White Knight Productions for providing me with the DVD for this review.